A rush transcript for "This Week" on September 3, 2017.
camera (Getty Images) (L-R) Sen. Ted Cruz in Cleveland, July 20, 2016 and Joaquin Castro in Philadelphia, July 28, 2016. THIS IS A RUSH TRANSCRIPT FOR SEPTEMBER 3, 2017 AND WILL BE UPDATED. MARTHA RADDATZ, HOST: Breaking overnight, just days after launching a missile over Japan, North Korea says it successfully tested a nuclear bomb, posing a direct challenge to President Trump. DONALD J. TRUMP, PRESIDENT OF THE UNITED STATES: They will be met with fire and fury. RADDATZ: Despite those earlier threats, North Korea's leader testing his first nuclear device in nearly a year, and the first since Donald Trump took office. DONALD J. TRUMP, PRESIDENT OF THE UNITED STATES: We'll handle North Korea. We handle everything. RADDATZ: Now, with North Korea showing no sign of stopping and the United States potentially within missile range, how will President Trump respond to the most serious foreign policy threat facing his administration? 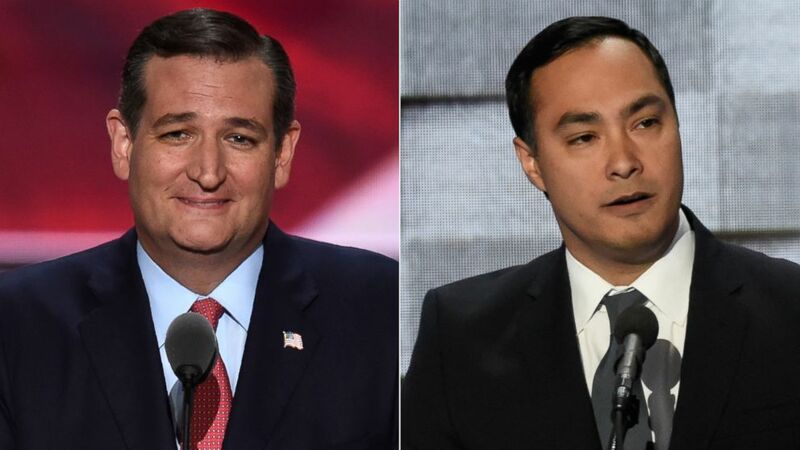 We'll break down the hard choices facing the White House and have reaction from influential voices on Capitol Hill -- Senator Ted Cruz and Congressman Joaquin Castro. RADDATZ: As the waters recede in Texas, the recovery begins. TRUMP: We have a long way to go, but the water is disappearing. RADDATZ: But with hundreds of thousands of homes damaged or destroyed and tens of thousands of Texans living in shelters, how will the survivors pick up the pieces? And are they getting the help they need? We need to understand this is going to take a long time. RADDATZ: We're here in Texas, in the air with rescue crews and on the ground with Governor Greg Abbott. From ABC News, it's a special edition of THIS WEEK. Reporting live from Houston, co-anchor Martha Raddatz. We are here in Houston, Texas covering that disastrous flood. You can see that debris behind me. A major domestic crisis. We'll get to all of that, but first, a major international crisis breaking overnight. Just before midnight, U.S. authorities detected an earthquake in North Korea. An hour later, the government of South Korea said it was caused by an underground nuclear test. 2:35 a.m. -- North Korean made it official, saying it had tested a hydrogen bomb, a bomb designed to be carried on an intercontinental ballistic missile. This is the sixth time North Korea has set off an underground nuclear device and the first such test since Donald Trump took office. According to Japanese authorities, the test bomb was the strongest yet -- four to five times as big as the bomb dropped on Nagasaki in 1945. Adding to the alarm, on Saturday, North Korea put out this photo -- what they claim to be a nuclear device small enough to fit on a missile. The great fear all along is that if North Korea can build a nuke that could reach the United States, the president will need to act. The president Tweeting this morning that North Korea has conducted a major nuclear test. Their words and actions continue to be very hostile and dangerous to the United States. North Korea is a rogue nation, which has become a great threat and embarrassment to China, which is trying to help, but with little success. South Korea is finding, as I have told them, that their talk of appeasement with North Korea will not work. They only understand one thing." For the president, it is a return to the tough tone of early August. RADDATZ: That was President Trump in early August, his tough talk cranking up the heat. TRUMP: If anything, maybe that statement wasn't tough enough. And we're backed by 100 percent by our military. RADDATZ: We were with the military in the region just weeks ago. I went to Osan Air Base in South Korea and witnessed the military flying some of it's most advanced war planes. RADDATZ: We were given incredibly rare access, a back seat ride-along on an F-16. UNIDENTIFIED MALE: We've got an altitude of 7,000. RADDATZ: In the front seat, Captain True Daniels (ph) from the 36th Fighter Squadron. CAPT. TRUE DANIELS, 36th FIGHTER SQUADRON: It's a pretty smooth ride, though, isn't it? RADDATZ: Just miles away from the demilitarized zone that divides North and South Korea. (on camera): So how far are we from the -- from North Korea right now? RADDATZ (voice-over): Flying through one of the most heavily restricted air spaces in the world, a state of constant readiness, always preparing for that call, should it ever come. The 36th flies about 170 sorties each week, simulating strikes on air defenses, tanks and more. (on camera): It must be strange. You're not really in a war zone, but it can happen at any time. UNIDENTIFIED MALE: I'll tell you, it definitely gives you a real purpose to waking up in the morning. And that's our mission here is to be ready to fight at a moment's notice. And that's why we like to say the 51st Fighter Wing is that we're ready to fight tonight. RADDATZ: Back on the ground, I ask Captain Daniels and fellow pilot Major Ram Weller (ph) what it would look like if tensions boiled over and real conflict began? UNIDENTIFIED MALE: We prepare mainly to deter North Korea and any aggressive stance that they take. And if ultimately our efforts to deter them fails, then we're mobilizing to defend the South Koreans and their way of life and ultimately the (inaudible) brothers and sisters in arms. RADDATZ: I think people always think, oh, the military, they're just ready for war. You're the last guys who want to go to war, right? UNIDENTIFIED MALE: Oh, sure. No one wants war to erupt on the peninsula. But the best way to prevent a war is to be ready. RADDATZ: Always ready there at Osan, but the threat of war ebbs and flows with every test, every response. Despite his fire and fury warning, President Trump sounded a more conciliatory note last week saying this about North Korean leader Kim Jong-un. TRUMP: Kim Jong-un, I respect the fact that I believe he is starting to respect us. I respect that fact very much, respect that fact. And maybe -- probably not -- but maybe, something positive can come about. RADDATZ: The overnight nuclear test anything, but positive. RADDATZ: Let's bring in ABC News contributor retired Colonel Steve Ganyard, who travels frequently to Asia. And Steve, let me ask you right away, this is a hugely provocative test. How do you see it? COL. STEVE GANYARD, U.S. ARMY (RET. ): Hugely provocative indeed, Martha. But it's also a big step change in North Korean nuclear technology. In the past, they'd been able to do a much simpler form of an atomic bomb. This thermonuclear bomb is five to ten times more powerful than anything they have ever demonstrated before, which represents a much bigger threat, not only to the to the region, but to the United States. RADDATZ: And we saw that picture of Kim Jong-un with what looked like a small nuclear weapon and a missile. What message is he trying to get across? GANYARD: This is most concerning, because we know -- or at least we believe that they've miniaturized one of their smaller nukes. If they're able to miniaturize one of their new thermonuclear devices, then that means five to 10 times more powerful, that much more of a threat to the United States. RADDATZ: South Korea this morning is saying that they will discuss ways to deploy the strongest strategic assets. What are they saying? GANYARD: The president of South Korea seems to be signaling that the -- he's going to ask the U.S. to redeploy tactical nuclear weapons. These are Cold War weapons called the Silver Bullet. It looks like a bomb, and it's silver, but it is a miniature tactical battlefield nuclear weapon. We pulled them off the South Korean peninsula in the early '90s. It sounds like the South Koreans are asking to have them redeployed so that a nuclear capability is on alert and ready to go to protect the South Korean people. RADDATZ: So, Steve, what do you think the options are here? GANYARD: The U.S. really has no military options? Nobody wants to conduct a preemptive or a preventative war, the cost would just be too high in lives, especially on the Korean peninsula. But the U.S. will go back and look at economic sanctions. Prime Minister Abe and President Trump have talked personally three times this week. And so there may be something brewing in the UN. But other than economic sanctions, we may have to learn to live with a nuclearized North Korea. RADDATZ: Thanks very for joining us, Colonel Ganyard. RADDATZ: That was Colonel Steve Ganyard speaking to us earlier this morning. Joining me now, Senator Ted Cruz, a member of the Senate Armed Services Committee. Thanks for joining us. I know you've been hard at work here in Houston. We'll talk about that in just a moment. But President Trump said North Korea, in his twee this morning, only understands one thing. What was he talking about, do you think? SEN. TED CRUZ, (R) TEXAS: Well listen, North Korea, right now, is the most dangerous place on the face of the planet. Kim Jong-un, who is the dictator there, he is radical. He is unpredictable. He is extreme. And he is getting more and more dangerous weapons. This step, if it is right that they have now developed a hydrogen bomb, is a serious escalation in their ability to commit mass acts of murder. And it is going to call for further serious steps to prevent North Korea from using those weapons. RADDATZ: And what kind of steps are you talking about? Again, President Trump said one thing. That certainly sounded -- made it sound like military action. CRUZ: Well, I think the president is right that Kim Jong-un and other bullies only understand and respect strength, that weakness, that appeasement, encourages this action. But in term of what happens, listen, no rational person wants to see a military conflict with North Korea, with the nuclear weapons, there almost any scenario, you're looking at tens or thousands or hundreds of thousands of casualties in a matter of days. It is very dangerous. That's why un wants those nuclear weapons, is precisely to make military conflict exceptionally costly. CRUZ: Yes. There is. And so what I have advocated for some time is a three-part strategy to deal with North Korea. The first focuses on exactly what you're talking about, which is missile defense, enhancing our missile defense. We have some missile defense capacity, increasing THAAD missile intercepters, but also increasing our land-based, our air-based, and our space-space missile intercept capability. This is something on the Senate Armed Services Committee I've been pushing for a long time to enhance our capacity and take to the next level the ability to take out an ICBM from North Korea that is targeting the United States. But if they continue on this path, the risks of their sending a missile that could murder millions of Americans, it's growing every day. RADDATZ: Senator Cruz, I know you have been working on it a long time, and it would take a long time. This is an urgent problem. If he keeps firing missiles -- as you saw, I was just over there, they're ready to fight tonight. It doesn't mean they want to. But this is an you urgent problem that will have to be dealt with very rapidly. CRUZ: No doubt. But what we need to plan also for the immediate and the long-term, you look at long-term planning. You look at, for example, what Israel has been able to do with missile defense, you look at the incredible success of Iron Dome and David Sling. Missile technology and missile interception technology has increased dramatically. And the next arena, the next theater where much of this is going to play out is in space. China is enhancing its ability to take out satellites in space. And we need to do the investment now so that in years to come, we have intercept capability. But the second part of what we need to do is use economic leverage to go against not only North Korea, but every financial institution, every company that does business with North Korea, almost all of them rely on the U.S. financial system. And so cutting off their money is another critical part. And then the third piece is delegitimatizing the oppression of the regime, following Reagan's successful strategy for delegitimatizing the Soviet Union. RADDATZ: With sanctions, which he clearly is not listening to. CRUZ: But to move forward with designating North Korea as a state sponsor of terrorism. And I think that's important as well, approaching all three aspects of the problem. RADDATZ: We have shows of force. We have sanctions. Nothing seems to work. Do you to think it hurt or helped when President Trump talked about fire and fury? Just a very simple answer. Hurt or help? CRUZ: The president speaks in ways that I wouldn't speak. But that is his prerogative. I do think it helps for North Korea and China to understand that we have a president who is strong. That is beneficial. I will say we're seeing some signs that China may be more helpful than they have in the past with North Korea. Now, I have very little trust that that will continue, but I think the only way we have a chance of it continuing is if it is coming from American strength and not a policy of weakness or appeasement. RADDATZ: And Senator Cruz, I do want to talk quickly with you. We are getting to a huge segment on Houston and the flooding. But I do want to talk to you just about what this last week has been like for you. CRUZ: This last week has been horrific. Houston is my home. I live a couple miles the from here. My mom lived a half mile from here. RADDATZ: Heart breaking to see this? CRUZ: Her grandparents lived right down the street. Her parent, rather, my grandparents. The damage is unlike anything I have ever seen. It's -- you know, in Houston, you're used to hurricanes, that's part of living on the Gulf Coast is you get hit by hurricanes and you come through it. This disaster, Harvey, is unlike anything we have ever seen. It hit down in south Texas. I spent yesterday was down in Victoria and Rockport and Aransas Pass and Port Aransas. The devastation there is massive, homes just obliterated. It parked over Houston for four to five days, dropping 50 inches of rain, 20 trillion gallons of rain. Then it went to Beaumont and Port Arthur. I'm going later today to visit the devastation there. RADDATZ: And we're going to get to that. Senator Cruz, I'm going to stop you right now. And I appreciate everything you've done this week. And I know the people of Houston do, as well. RADDATZ: We are back live now with Congressman Joaquin Castro. And Congressman Castro, we heard what you said just before the break there about what North Korea might be capable of doing and what we have to watch out for. You know they had this overnight nuclear test. You've seen those pictures of Kim Jong-un with what looks like a miniaturized nuclear weapon on an ICBM. CASTRO: That's right. And if the reports are to be believed, then it's quite possible that they've achieved the ability to send a nuclear weapon to the mainland United States. And so at this point, anybody who's advocating for military action against North Korea is advocating for military action against a nuclear power who has also made threats against the United States. I think that the best course of action for Donald Trump now and for the United States is to use the significant sanctions that were passed at the United Nations about three weeks ago, which were the strictest sanctions North Korea has ever existed under, and use those sanctions to work with China, to work with our allies and to marshal the world to choke the economy of North Korea and bring them to the table. RADDATZ: But I think that's exactly what they were trying to do during this period. And instead, you have Kim Jong-un blasting off missiles. You have this nuclear test. He hadn't tested a nuclear weapon for a year. We've had a show of force. I saw them over there, you know, flying jets around and whatever they can do to show that we're tough. CASTRO: No, that's right, Martha. Look, we tried a basically an approach of isolation and non-engagement after the failure of the six-party talks. And they've been developing this nuclear technology. Part of the challenge for the United States and for our allies is that our intelligence has also not been perfect. So, we weren't exactly sure how far along their nuclear capacity has evolved. So, there's always been a very big risk involved. At the same time, we have not gone all out the way we are now in term of secondary sanctions against Chinese and Russian institutions that are still doing business with North Korea. And at this point you know that have essentially got to choke their economy and bring them to the table. RADDATZ: And how long do you think that would actually take? I mean, he seems so intent on getting a nuclear weapon. How long do you think it would take to really choke the economy if we get the cooperation from others? CASTRO: A lot of that depends on China, because most of the economy of North Korea has left, that exists, has to do with China. So, it depends on China's willingness to be helpful, which they've -- as the president has noted they have gotten better about. But also our willingness to sanction Chinese institutions that still do business with North Korea. RADDATZ: And what other options if that fails? And what about our allies in the region? There are reports right now that President Trump is considering withdrawing from a trade pack with South Korea, who we need. Well, first of all, the president -- President Obama back then and President Trump, have reiterated our commitments to South Korea and to Japan. So those are rock solid. But remember, there's also hundreds of thousands of Americans who live in South Korea and Japan who would be directly in harm's way if there was military action to happen there. So, you know, we have got to make sure that we marshal all of our resources. This has got to be a time when the president puts aside any other big differences like a trade agreement with South Korea. And he's on the same page with the leaders of South Korea and Japan. So that we're all working on this together. This is not the time to get into a big trade fight with South Korea. RADDATZ: Senator Cruz talks about building up our defensive capabilities. Would you agree with that? Is that something we should really concentrate on? CASTRO: I absolutely agree. And it would be a time, I think, to possibly test our defensive systems, like of a THAAD missile defense system, which is based part of it at least in South Korea. And don't get me wrong, Martha, look, if they strike our allies, they have to know that we'll strike back. RADDATZ: Do you think Kim would actually do a first strike? Do you think he's crazy enough to do something like this? Or is this all about negotiations and power? CASTRO: I believe that it's probably about negotiations and power, but because North Korea is such an isolated nation in the world, it's impossible to answer that question with complete certainty. RADDATZ: And you heard the president's, or saw the president's tweets this morning, I imagine, also his comments about fire and fury. What do you think that did to this equation? CASTRO: I don't think that it's been helpful. I don't think that it's helpful to get in to a Twitter shouting match with a 32-year-old dictator, Kim Jong-un, in North Korea. I think, unfortunately, that it's escalated the tension and the situation. And he needs to let his diplomats and his military generals and others handle this situation. RADDATZ: So just quickly, what do you see happening in the next month, in the next two months? What would you like to see happen in terms of the language coming from the White House and in terms of what the White House does? CASTRO: Number one, I think they're going to have to continue iterate our support for our allies in the region. Secondly, we're going to have to continue to pursue secondary sanctions against the institutions in whatever country they find themselves that are, propping up the economy in North Korea. And and then there's got to be an earnest effort to actually bring them to the table. RADDATZ: OK, thank you very much, Congressman Castro. And thank you for all you've done this week to help Houston and others recover. Thanks very much. When we come back, from rescue to recovery we're on the front lines with the men and women working to get Texas back on its feet after Hurricane Harvey. More from Houston after this. RADDATZ: Welcome back to Houston. All week long, we have witnessed unbelievable scenes of devastation, stories both heart breaking and uplifting. This street I'm on, it was a river just a few days ago. Now, the tide has turned, the water is indeed receding. But we're here this morning because as anyone who has survived a flood can tell you, the end of the immediate crisis is just the start. And so now, the real work begins. RADDATZ: Harvey's swath of devastation is painfully clear from the air, row after row of homes near Beaumont, Texas, east of Houston near the Louisiana border, still submerged in flood waters, some to the roof line. I flew along the Texas coast by helicopter with the 41st rescue squadron out of Moody Air Force Base in Georgia. A crew of young, but seasoned combat veterans now saving lives at home in the U.S., with a sense of such urgency and purpose, we refueled midair so the crew could have maximum time to search for anyone still in need of help. These airmen have been conducting rescues here all week, plucking Texans from their flooded homes and taking them to dry ground. You were showing me some pictures of people as they were rescued. Just tell me from you heart what this has been like? JOSHUA MORENO, 38TH RESCUE SQUADRON: It goes without words. It's so rewarding. Period. Just the look on people's faces when they see you, that you're there to get them out of the situation that they're in, being able to bring them to a better place. So, I'll do it all day every day if I could. RADDATZ: Even those neighborhoods where the waters have receded have a long road to recovery. RADDATZ: Where we're flying over now has dried out. Just days ago, it was completely submerged. And the people who live in these neighborhoods are devastated in such unexpected ways. We picked up Nicole Kavitz (ph), a paramedic who has been aiding Harvey victims all week. But then she got word that her own father was in critical condition from heart failure. So, are we dropping her off or picking him up? UNIDENTIFIED MALE: We're dropping her off at the hospital. It's on our way home, so it was a good opportunity to help out. RADDATZ: Unreachable by ground, our helicopter delivered her to her father's bedside where he's now recovering. UNIDENTIFIED: Sir, we are complete with our patient transfer. RADDATZ: It was in the midst of this transition from rescue to recovery that President Trump made his second visit to Texas, this time meeting with some of the many families displaced by Harvey, now with a sprawling relief center at Houston's NRG stadium. The president and first lady helping to hand out meals. President Trump posing for a few selfies and talking in glowing terms about the relief efforts. TRUMP: It's been really nice. It's been a wonderful thing. It's -- as tough as this was, it's been a wonderful thing I think even for the country to watch or for the world to watch. It's been beautiful. RADDATZ: Congressman Michael McCaul from Texas was with President Trump. REP. MICHAEL MCCAUL, (R) TEXAS: I saw Katrina and that disaster, and Rita, and Sandy. I think this has been the best emergency response deployment that I have seen. And I think Texas, we have weathered these storms in the past. We have a great state operation that can get things done. RADDATZ: At the president's side throughout his visit, Texas Governor Greg Abbott. TRUMP: The cameras are blazing, I have to say, you have a great, great governor. And he's done a fantastic job. RADDATZ: We met up with Governor Abbott just after the president's departure. (on camera): Oh, we just watched Air Force One taking off. You were there the moment he arrived. You were there with him all day. You were there when he left. Give us a sense of the kinds of questions he was asking. ABBOTT: Well, he asked me repeatedly today, Governor, what do you need? What can I do to help you, from top to bottom? The federal government has operated seamlessly with the state of Texas, as well as with our local governments. And I'll tell you, the results have led to more lives being saved, a quicker response, a more effective response to the states. But one thing we all know is we have a lot more work to do. RADDATZ: What is your greatest concern going forward? ABBOTT: I'm still working on rescue missions over in Beaumont and down the part of the Brazos River. So we are still in an operational mode where we're working to save every life. But what we could see as we've traveled the streets today are Texans were pulling out carpets, pulling out sheet rock. Texans have already gone to work to begin the rebuilding process. RADDATZ: How long do you think this recovery will take? We've heard President Trump say maybe two or three years, but because it's Texas, six months? ABBOTT: Well, we know Texans will respond robustly. However, that said, when you consider the hundreds of thousands of homes that have been destroyed and impacted by this, we need to understand, this is going to take a long time. RADDATZ: Houston was built on a -- basically, a flood plain. I read so many stories about there's no drainage. Should people just be allowed to come back? Developers, let's build those homes again? ABBOTT: I think -- listen, it would be insane for us to rebuild on property that has been flooded multiple times. So I think everybody probably is in agreement that there are better strategies that we must employ. RADDATZ: So what can we expect in the coming days here, Governor? ABBOTT: Well, as these helicopters fly away and as the TV cameras leave town, that's when the hard work really begins. But the truth is, we have local leaders all the way from Beaumont, that has a terrific mayor, to Houston, all the way over to Corpus Christi. And we're all going to be working very collaboratively to recover as quick as possible. Texans have grit. They will respond with speed and with fellowship. RADDATZ (voice-over): One of those local leaders on the front lines, Houston Police Chief Art Acevedo. CHIEF ART ACEVEDO, HOUSTON POLICE DEPARTMENT: Come on now. RADDATZ: Who we met with as he checked in on evacuees and volunteers at Houston's convention center. ACEVEDO: Our biggest challenge right now is trying to get people back in their homes. RADDATZ: The hardest moment for him this week, when a veteran of Houston's police force, Sergeant Steve Perez, died in the floodwaters. (on camera): What moment is going to stay you favor? ACEVEDO: The look on my divers' faces when we were trying -- wanted to recover one of our own. He was in muddy water. And the pain in their eyes when they knew the -- what I told them, we can't risk another life. We made up for that the next day when I told Steve -- Steve's wife, if Steve knew this was his last day on Earth, how would he have wanted to go, here with you or answering the bell? And she said Chief, the last thing he said to me is we've got work to do. And that's exactly where he wanted to be. RADDATZ (voice-over): But the Chief's work to help evacuees may be complicated by a new challenge. President Trump set to announce his decision this week on whether to end the DACA program, which allows undocumented immigrants who came to this country as children to stay under work permits. ACEVEDO: There are so many homes that have been damaged and some beyond repair in our state. And then you add on top of that, all the issues with a the immigration debate and all the ugliness of that, it was -- I was, you know, mentioning to somebody yesterday, it's a state official that was pushing this anti-immigrant ugly narrative. And I'm thinking -- and I asked him, now what are you going to tell the American people when we've scared away so many hardworking people? RADDATZ: Houston has one of the highest populations of so-called Dreamers in the country. We met one of them, 15-year-old Yasmine Madrano, as her family returned to their flooded out Houston home, which they just recently paid off. YASMINE MADRANO: It's a lot of work. Yes. MADRANO: All the -- our house is just crumbling down like that. It's sad. RADDATZ: Her family came to the U.S. when she was five. She just applied for DACA status. Now the stress of both Harvey and the president's looming decision is taking its toll on her dream of becoming a surgeon. MADRANO: My biggest fear is for us to get deported. For my family, after all the hard work that they have done, to just be thrown away and then go back to how we were. And for me, to not be able to study, not be able to work, it's a lot. And I still have to worry about going back to school, so it's kind of stressful. RADDATZ: I asked governor Abbott about Yasmin (ph). She said she that doesn't know what she's more nervous about is flood or being deported. When should she stop being nervous? ABBOTT: Well, that obviously would depend upon so many factors that are hard to predict right now. One would be what the president would do, another would be what congress would do. So Martha, until congress, until the United States, truly reforms our immigration system with standards that everybody knows and understands, that are enforced and applied, we will continue to deal with these very challenging circumstances. RADDATZ: So, what would you say to that 15-year-old? ABBOTT: The best place to get into is the United States of America. And we need to make sure we keep America, that shining city on the hill that people aspire to. RADDATZ: So, it's not with someone like her here? ABBOTT: It's going to be a standard that ensures that America will be the place that people aspire to and there will be ways if congress reforms the immigration system, there will be ways in which America needs to continue to attract immigration through the legal system. RADDATZ: The experience of Harvey has been a profound moment in a tumultuous year, showing the best of America, but also threatening to expose the cost of the rancor and division that has infected our political life. You can see that in the faces of families like the Madranos (ph), their uneasy existence in America ever more tenuous. And in the uncertainty about Houston's future and the hard questions facing this country. Will the spirit that got this city through the crisis last in the aftermath? Was Harvey a genuine watershed moment or will the underlying tensions tearing America apart rise again as the waters recede. RADDATZ: President Trump did, indeed, face intense scrutiny this week, responding to the first natural disaster of his presidency. Coming up, how Harvey changed the political conversation. And what to expect when congress returns to Washington this week after the August recess. RADDATZ: President Trump there on the second leg of his tour of the region hit by Harvey. After leaving Houston, he headed 150 miles east to Lake Charles, Louisiana, where he greeted flood victims and thanked volunteers and first responders. Here to discuss the president's visit and all the week's news, ABC News political analyst Matthew Dowd, who calls Austin, Texas, home; Houston city council member Amanda Edwards; and presidential historian and ABC News contributor Mark Updegrove, who also lives in nearby Austin. Welcome everybody. And, Matt, I want to start with you, you have talked a lot about the president's first visit. You worked in the White House during President Bush's response to Hurricane Katrina. How do you think President Trump has handled this, especially given yesterday's visit. MATTHEW DOWD, ABC NEWS POLITICAL ANALYST: Well, I think you have seen the city, the county, and state really show up and be big in this and do it all right, I think, in this. I think the president and his staff learned the lesson of Katrina, which is you need to show up quickly and show up in force, which President Bush didn't do initially in the aftermath of that awful hurricane. But I think the president has to figure out the right tone. I mean part of being a president is not only showing up, but, actually conveying to the American public that you have empathy, that you have compassion, that you understand what's going on. And I think one of the difficulties he's had is that he has a trust deficit. When this hurricane happened, he -- it happened on a watch where he had a trust deficit and two thirds of the country didn't trust him. So I think that's part of his problem, is he has to fix that. And I think everything in these kind of things is in the follow-up. This is like the shock and awe stage. The shock at what happened and the awe of watching people deal with this. But it's really in the weeks to come whether or not the president can demonstrate he's going to do what's necessary to get done to fix this. RADDATZ: And, Mark, did he set the right tone yesterday? MARK UPDEGROVE, PRESIDENTIAL HISTORIAN: I think he did yesterday, Martha. Yes. I think, you know, it's coming off a low. I mean we -- we're -- Charlottesville was just a couple of weeks ago. And I think that was the low for his presidency. That might have been the low for almost any modern presidency. So I think, as Matt said, just showing up, showing a little empathy, showing some compassion, helped. And, but as Matt also suggested, the real proof is going to be in the weeks and months and years ahead, as this city rebuilds. RADDATZ: And, Councilwoman, thanks for being here. I know this is an incredible week for you here in Houston. Did President Trump -- how was that visit, do you think, received? We all just saw him greeting some of the victims and some of the first responders, who were all very positive about his visit. But overall, are people really paying attention to that or -- as they do on this sad street, have too much work to do? AMANDA EDWARDS, HOUSTON CITY COUNCIL MEMBER: I think you've hit the nail on the head, Martha. As you look around and you see how much devastation has really taken place here, people are focused on not only just trying to get their lives stabilized and get over the shock of the crisis that just has manifest here in Houston and the surrounding areas, but then also asking the question, where do we go from here? Yesterday, we canvassed areas where people weren't even aware that they needed to tear out sheet rock that had been exposed to moisture and flooding. And so there is a huge curb of education that needs to take place. But then in addition, there's a whole lot of work to do. So the focus has really been on the work going forward and just trying to focus on how to rebuild next. RADDATZ: And Matt, one of the things he's done is he's pulled back from his threat, it seems, of shutting down the government if they don't get a border wall. Talk, if you can, about how this converges with the border wall, converges with what happens on Capitol Hill. DOWD: I think when you have a devastating like we've had and a crisis like we have, it resets the entire table politically in all of this. I think that the funding is going to go through. I think it's going to be fairly automatic in the next week and weeks ahead. I think all the decisions he makes now, and Congress makes, Republicans in Congress make now, are going to be in the aftermath of this. And people are going to be watching this through that prism. So I think all of their ideas before of how they were going to make cuts in certain programs, I think, are all going to be off the table in the midst of this. I think everybody has to figure out how do they conduct themselves in a new way in the midst of the devastation, knowing full well that the problems before, the dysfunction that existed in Washington before, people couldn't tolerate it before. They're going to be having less patience for it today. RADDATZ: They're going to be having less patience, but we've seen horrible things happen before and people may come together just as beautifully as they did in Houston. UPDEGROVE: Well, I hope it lasts. This is an opportunity to unify everybody. And, you know, we're in a state where it is historically distrustful of big government. But this is where big government comes into play. You know, you have to have a government come around a situation like this in order to propose or to offer solutions. DOWD: -- I think part of the thing -- and I'm going to follow up with something that Mark said -- is this demonstrates why we need certain institutions of our democracy and institutions that were put in place by our founders in this. All of this talk about we're going to destroy the institutions and we're going to break it all down and all this, I think this crisis and this devastation demonstrates how our standards of democracy we have, how we talk to each other and how we relate to each other, and the institutions that help fix the problems, how necessary they are. RADDATZ: But President Trump has really said -- and you know this, as well -- all of you know this -- the federal government, get out of the way -- get out of the way. DOWD: Well, he's been saying it. RADDATZ: -- to save you? DOWD: It's not -- he's been not -- he's been known to take great turns in the midst of this. RADDATZ: I hadn't noticed that. DACA is a great example, a recent turn. Maybe we'll get to DACA. EDWARDS: -- but I do want to call to our attention while we're focused on what the politics have been, I think it's critical that we get past just the partisan politics in this situation and focus on the needs of the people. There has been no greater and more moving experience than to see people bonding together and helping each other, Republican, Democrat and coming together. The true test of leadership, however, will be what are we going to do for the people going forward? How do we parse through those politics and get to the needs of the people? And part of that is making sure that we have adequate funding here in this region to make sure that people can rebuild their lives and get back to work. RADDATZ: And the needs of the people, some of the people who live here, DACA, the Dreamers. The young woman we talked to who to, can't decide whether she's more nervous about the floods or getting deported. What do you think is going to happen? EDWARDS: And we have got a tremendous amount of Dreamers here. They came here to this country. They were brought by their parents. They want to contribute to the community and society in which they live. That's all they want to do. And what we want them to be able to do is is be part of this rebuilding, be able get to back the work, not be afraid to leave their homes in an instance of crisis, not be afraid that they're going to lose their jobs because of this DACA situation. And so now is not the time to raise that and destabilize an area like this region. It would undermine all of the other efforts that are taking place right now. DOWD: I've lived in Texas for 33 years in this. Most of these homes were probably built with the help of undocumented workers in Houston. And most of the cleanup that's going to happen is going to happen in a large part because of undocumented people in this country that put everything on their back, that do the work for minimum wage or just above minimum wage. So, I think, this is another area where people are going to have to pull back and say now is not the time to be divisive, to be partisan in the midst of this, because so much of what is going to happen in the cleanup of Houston, Port Arthur, Beaumont, Victoria, Rockport is going to happen based on the back of undocumented workers. RADDATZ: And what happens if he takes this on, Mark? UPDEGROVE: I was just going to say, Martha, the one thing about this president, he's always wanted to show how strong he is. And usually, that strength is exhibited in pugnacity and combativeness. And in this -- we saw yesterday, a more compassionate, more empathetic president. And sometimes, I think presidents can look strong by being compassionate. I hope you saw some of that yesterday. I hope that we see more of that from the president. RADDATZ: I can kind of understand why he's tweeting about that today, Matt. DOWD: Understandably, but I think part of what the problem we're in today is the belligerent language that he's used over the last three or four months several months (inaudible), a problem that you discussed earlier that is very difficult. I actually think we need to reset our entire foreign policy and assume North Korea is a nuclear power and then how do we deter them or how do we contain them. Instead, this continued belligerence. RADDATZ: We just have about 40 seconds here. And I want to end with you, if I could councilwoman, and just your thoughts this week and what you went through and what your city went through. The people of this area have experienced a trauma that is hard to put into words, thinking about boat rescues from your home, thinking about seeing people who you think may lose their lives, discovering people whose lives have been lost. It has definitely been a traumatic situation, but the question isn't always just about how you fall, it's about how well you get up, and the leadership of this country can be a huge component of making sure that we get back up, that we use this situation as an opportunity to rebuild and correct things that weren't right before. And so, I'm hopeful we can pierce through some of those politics and make sure that we focus in on how to rebuild lives, how to touch human lives and make sure that we're stabilized in this region. RADDATZ: Thank you so much. It was beautiful watching the the people of Houston come together. RADDATZ: Texans all, you bet. Mother nature's fury was on full display this week, but so was the compassion. Those who came to the rescue of their neighbors and the resilience of the flood victims who are already rebuilding. We'll be right back with that story, next. COURTNEY FISCHER, KTRK-TV HOUSTON: Wish we could take everyone right now. We'll be right back. And this woman in the window. Lin (ph), I don't know if you can see this woman over here. I mean, this is what people are doing right now with their pets and animals and it's actually heartbreaking to leave a neighborhood and say to these people come back, because I've said it like four or five times now. RADDATZ: That's Courtney Fisher (ph) of our Houston station. Courtney you are with KTRK, our wonderful Houston affiliate. We've known each other for awhile. I so admire what you've done this week. We saw that very emotional, emotional set there. Tell us what it's been like. FISCHER: It has been non-stop. I think that nobody has gotten a break. It's been exhausting, but I cannot even imagine how the people who have lived this have fared, because we still get to go home and talk to families. I mean, many of us have slept at the station and been displaced. And I don't know how some of my colleagues powered through this week, but just seeing all of those people in homes that have struggled and lost everything. RADDATZ: But it's also, it's very different when it's your home. And I don't know what happened to you and your family. I know you were out there helping people yesterday get their lives back together, but explain how different it is when you're covering a story about your home. FISCHER: Right. I think that there are moments where you just forget to kind of go through that emotion and then you just can't keep it in any more. I know several colleagues have broken down on camera, because they're out there trying to help and save people. And at some point, you just have to say good-bye and you can't keep helping people who are stuck. That's heartbreaking to leave them in their flooded homes. RADDATZ: Well, I said to you in an email earlier this week that shows you have a heart and you have a soul. And you're a magnificent reporter. Thanks so much, Courtney for all you've done this week. In the month of August, seven service members died overseas supporting operations in Iraq and Afghanistan. That's all for us today from here in Houston. Thanks for sharing part of your Sunday with us. Check out World News tonight. And have a great day.